LPM: What do you make of the charges leveled against you? As far as I can see, they have not twisted what I said. What is twisted is their sly, toxic ‘definition of anti-Semitism’. In relation to the second charge all I have to say is this: I am not, nor ever have been, a member of the organisations cited: CPGB and LPM (to quote the old McCarthyite formula). However, I can’t deny or confirm being ‘associated’ with them, because I do not know what this is supposed to mean. LPM: Frankly, I enjoyed your article but I didn’t anticipate it would cause so much fuss! How do you explain the vehemence of the attacks on your contribution? Why is this happening? MM: It’s the result of a conjunction of two things. I follow the Israeli press very closely and the wider political discussions in Israel in general. Quite some time ago – and I’m talking about before anyone imagined that Corbyn would be Labour Party leader (least of all himself!) 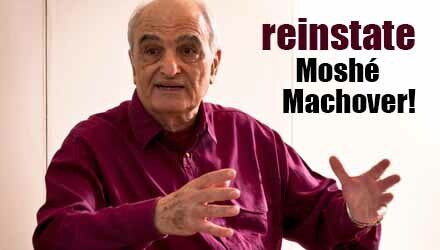 – there was a feeling in Israeli establishment circles that they were losing the propaganda war. They responded with the Hasbara campaign.1)Hasbara is a Hebrew word for the public relations efforts of the Israeli state to disseminate abroad positive propaganda about itself and its actions. This was part of a decision was made to go onto the offensive: in a sense, it’s the last ditch attempt to rescue the international reputation of this state. They are losing credibility on the arena of what could be called international opinion, but – more importantly – they are losing the Jewish public outside Israel, especially those under 30. There is a clear generational shift in opinion. These people are becoming very critical of Israel and its colonisation project. You could see a sign of this at the Labour conference on September 27, in Corbyn’s leader speech to close the event. His call for Israel to stop the oppression of the Palestinians and to end the savage oppression of these people won loud applause.2)“…let’s give real support to end the oppression of the Palestinian people, the 50-year occupation and illegal settlement expansion and move to a genuine two-state solution of the Israel-Palestine conflict” (https://www.totalpolitics.com/articles/news/jeremy-corbyn%E2%80%99s-2017-labour-conference-speech-full-transcript) This was a sign of the times. It’s an indicator of what the general public has come to feel – including a large percentage of Jewish people, especially the youth. Remember, the Israeli establishment identified this quite some time before Corbyn’s breakthrough was on the agenda. They had already decided to go on the attack internationally, using this ‘dirty bomb’ tactic of labelling any criticism of Zionism and its colonisation project as anti-Semitic. In the UK, they found useful fools in the form of the Labour right wing. 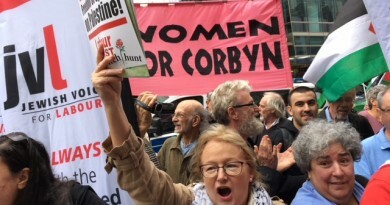 The Israeli state’s propaganda tactic of smearing all criticism of itself as anti-Jewish coincided with the Labour’s right’s need to discredit Corbyn and the left of the party. Now Corbyn has plenty of enemies – both inside and outside the party! So this smear tactic was eagerly seized upon – including by people who care absolutely nothing about the issues of Israel-Palestine, the Jews, Zionism and all these important questions. They are totally cynical in their use of these issues. As Chris Williamson’s phrase goes, the Labour right “weaponised” the sensitive and complex issue of anti-Semitism for the sake of narrow, factional advantage against a left in the Labour Party that was growing and threatening to overwhelm them. LPM: Mike Katz of the Jewish Labour Movement 3)Mike Katz is a leading member of the Jewish Labour Movement. A fuller biography of the man can be read here – http://www.mikekatz.org/about-me/ dubbed you an “amoral historian” in conversation with one of our supporters at the Brighton Labour conference. He couldn’t really elaborate on this category when challenged to do so. He didn’t directly contest the veracity of anything you said: he simply seemed to be implying that bringing up the issue of the limited collaboration between Zionist organisations as the Nazi regime at all is outside the boundaries of social/political acceptability. But, as I say, that’s a guess! What do you think he’s talking about? In these, I make it crystal clear that moral judgements of historical events are very important. But first, you need the facts. You mustn’t start with a moral, value-laden attitude to past events. In the first instance, establish what happened. The moral judgements must come later. Everyone is entitled to their own moral assessments of the historical actions of individuals, groups, parties or social classes. We can disagree. But people are not entitled to ‘alternative facts’. The factual record I refer to in my article is there, it is available to access, the basic record of the events I write about is uncontested. (As you say, Mike Katz didn’t contest them either!) So, accept that these events took place, they are part of history and must be explained. Then let’s talk about morality! LPM: The JLM seem to approach historical truth and investigation with parameters that set by what is sayable – what is permitted to be spoken of, regardless of whether it is an actual historical fact. MM: Here are some historical facts, then. We are closing in on the century of the Balfour declaration.5)The Balfour Declaration was a public statement in the form of a letter to Lord Rothschild, issued by the British government during WWI announcing support for the establishment of a Jewish “national home” in Palestine. The area was then an Ottoman region with an Arab population and a tiny Jewish minority. It’s interesting to read what the Board of Deputies of British Jews said about it at the time. During the discussions around the declaration, spokespeople of the BDBJ expressed consistent and fundamental objections to the general plan for the Zionist colonisation of Palestine and specifically to the idea that the Jews in Britain were a separate race or nationality. 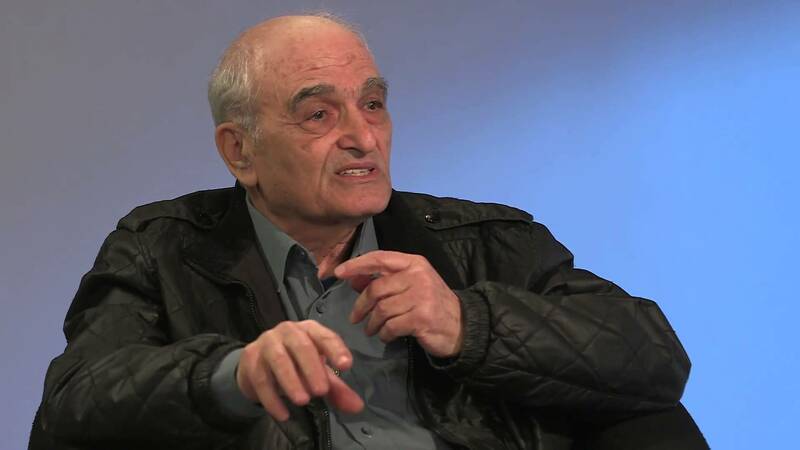 In fact, the Zionists of that time – who, it must be remembered, were a minority amongst British Jews and minorities in all western European countries – would have regarded Wolf’s stance as abominable. a secular Jewish nationality recruited on some loose and obscure principle of race and of ethnographic peculiarity. LPM: And isn’t this the specific feature that you point to when you reference the limited ‘commonality’ of one aspect Zionism and the Nazis. The notion of the Jews as a race; the idea that they could not live amongst gentiles without constant conflict and friction; that assimilation was an illusion and, therefore, there was the need for the Jews to separate themselves from the Gentiles and vice versa? MM: Yes, but let’s remember something about that Heydrich7)Reinhard Tristan Eugen Heydrich was a high-ranking Nazi SS commander during World War II, and a main architect of the Holocaust. quotation in my original article – the one that caused LPMers so much trouble from JLM activists outside the Labour conference!8)http://labourpartymarxists.org.uk/john-mann-mp-expel-labour-party-marxists/ In this, Heydrich is responding to a reciprocal overture on the part of German Zionists. Let me put this in its historical context. This context was the publication of the notorious, abominable Nuremberg Laws against German Jews – probably the foulest racist laws enacted.9)The Nuremberg laws (1935) institutionalised many of the racial theories of Nazi ideology. The laws excluded German Jews from Reich citizenship and prohibited them from marrying or having sexual relations with persons of “German or related blood.” These were published in September 1935. Of course, most German Jews felt the same as Lucien Wolf and the Montefiores in Britain: they regarded themselves as Germans by nationality and Jews by religion or religious background. Germany has merely drawn the practical consequences from this and is meeting the demand of the International Zionist Congress when it declares the Jews now living in Germany to be a national minority. So, according to this leading Zionist, by enacting the Nuremburg laws, the German Reich is implicitly accepting the position of the international Zionist Congress. Of course, we look back at this history with the 20/20 vision of hindsight. We know the end of the story as it were; where the Jews of Europe actually ended up – facing physical extermination. And, of course, you cannot be sure that Heydrich himself was guilty of dissimulation when he responded positively to this overture. He may have been lying; or, as some historians argue, that at the point in history the ‘Final Solution’ was not yet the fixed policy of the Nazi state. It was very important for the Nazis state to insist that Jews were not simply a religion because it was not the policy – in general – of their state to persecute and discriminate in such an extreme way against religious minorities. Thus, they insisted that the Jews were a separate nation/race. In this respect, their view clearly coincided with that of the Zionist movement – which, remember, was a minority viewpoint amongst German Jews. In that sense, Heydrich was using the Zionists against the majority of the German Jews. He was using Zionism as a polemical stick against the majority viewpoint of German Jews – for assimilation and full civil rights in Germany, the country of their birth. 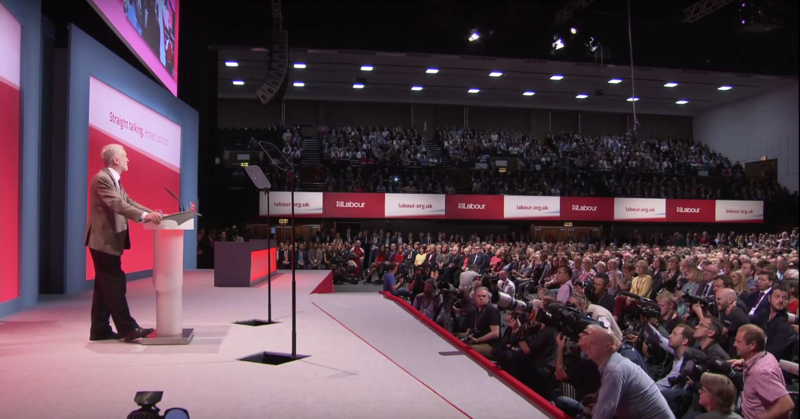 LPM: What’s your estimation of the Labour conference and what does the controversy around this sensitive question tell us about the current balance of forces between the left and right? There are contradictions. One the one hand, Corbyn wins enthusiastic applause when he calls for an end of the oppressions of the Palestinians. On the other hand, we have an ongoing guerrilla war in the lower levels of the party – at the level of council votes, for example – where bad positions are being adopted, very dangerous votes taken. So, the “weaponisation” of anti-Semitism continues, but can move into different arenas of struggle. We can make progress in the Labour Party itself, but then in local councils the rightwing Labour councillors can stop education on the issue of Israel-Palestine, they can close down actions and meetings in solidarity with the Palestinians, etc. The fight isn’t over! This dirty war against us will continue and probably intensify as the pro-Israel apologists and rightist in the party lose ground. 1. ↑ Hasbara is a Hebrew word for the public relations efforts of the Israeli state to disseminate abroad positive propaganda about itself and its actions. 5. ↑ The Balfour Declaration was a public statement in the form of a letter to Lord Rothschild, issued by the British government during WWI announcing support for the establishment of a Jewish “national home” in Palestine. The area was then an Ottoman region with an Arab population and a tiny Jewish minority. 6. ↑ Lucien Wolf was a British-Jewish journalist and historian of Anglo-Jewry. He was a campaigner for Jewish civil rights and an outspoken opponent of political Zionism. 7. ↑ Reinhard Tristan Eugen Heydrich was a high-ranking Nazi SS commander during World War II, and a main architect of the Holocaust. ← Tories: Ready to fall – and then?